Anne Raitt is a British actress who has appeared in numerous films, TV and theatre productions. After leaving The Edinburgh College of Speech & Drama (LRAM) one of Anne’s first appearances on stage was as a witch in Macbeth in 1964; a Traverse production for The Edinburgh Festival in the Assembly Hall. During the same Festival, along with fellow sorceress Brigit Forsyth, Anne gave late night concerts of folk songs. 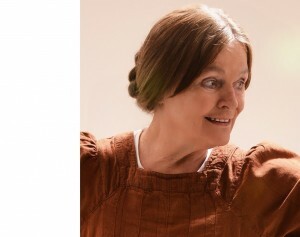 Anne was asked subsequently to join the Victoria Theatre-in-the-Round, writing and singing for documentaries devised by Peter Cheeseman and Peter Terson. There she also performed Chekov, Shakespeare and Sophocles. Experience in the classics was extended later in her career when she joined the Royal Shakespeare Company, playing leading roles in seasons at Stratford, The Aldwych and the Donmar theatres. She has continued performing in many theatres throughout the country. Anne has appeared in film and television, most famously starring in Mike Leigh’s first feature film ‘Bleak Moments’, and Jack Gold’s television ‘God Bless Thee’. She has appeared in many television films and series for the BBC, STV and Granada. Anne lives in a small village in Scotland with which she has been associated since early childhood. She is part of a thriving community there and recently organised a concert with the children of the village to raise funds for the children of Syria and The Red Cross. The setting of one of her recent projects, ‘The Mother of All Burns’, is only a few miles from her cottage. She has recently collaborated with her old friend and fellow actor and musician, Brigit Forsyth, producing a folk music album, Angel of the North. This website is not intended as a comprehensive study of all Anne’s work but as a flavour of what interests her.